We love baked ham and don’t know why so many save it only for Christmas. It’s great for Sunday lunch with champ, cauliflower cheese and greens and there is always loads leftover for sambos (that’s sandwiches for the non-Irish). Wine Suggestion: lucky us had a bottle of the Jamet IGP Syrah from the Northern Rhône. Jamet is a top producer of Côte Rôtie, which Jono’s company imports, and the Syrah is their joyful entry level wine which is allocated in small lots. We get an allocation of 6 bottles which we happily buy each time a shipment arrives, we wish we could get more. Works perfectly with the ham too. Soak the gammon in cold water overnight, then rinse well and put into a large saucepan. Cover with fresh cold water and add the onion, carrot, bay leaves and peppercorns. Bring to the boil slowly, then cover and simmer very gently for 1½ hours, skim off any white froth from the surface now and then. Remove from the heat and leave to cool in the liquid. Remove the gammon from the liquid and cut away the rind leaving a thin layer of fat. Score the fat in a diamond pattern and put the joint into a small roasting tin, then pour in the orange juice. Mix the mustard, honey and sugar together and season generously with black pepper, then smear all over the gammon. Bake for 25-30 minutes or until caramelised. Leave to rest in a warm place for at least 20 minutes, then carve. 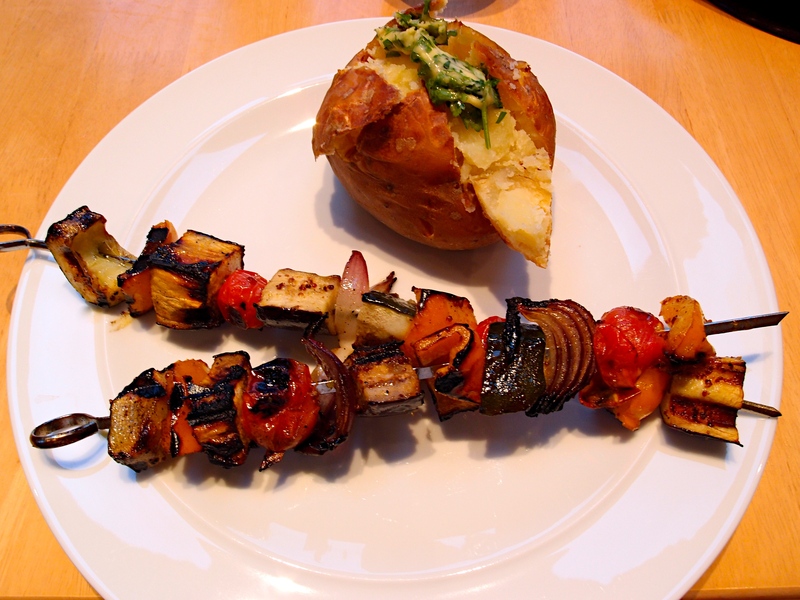 This is a veggie version of our Easy BBQ Kebabs and this time we made our own honey-mustard marinade. Another convenience item that we won’t be buying again as it’s just so simple to make (and we always have honey and mustard in the cupboard). These should keep your veggie friends happy or you can serve them as a side dish for the carnivores. We had them with baked potatoes and parsley butter as there was leftover parsley in the fridge. Very yummy indeed. If you only have wooden skewers you need to soak them for about 30 minutes or they will burn on the barbecue. We like metal ones. Blend the honey, mustard and oil with seasoning. Thread the vegetables onto the skewers and brush with the glaze. Cook for 20-30 minutes on the barbecue. 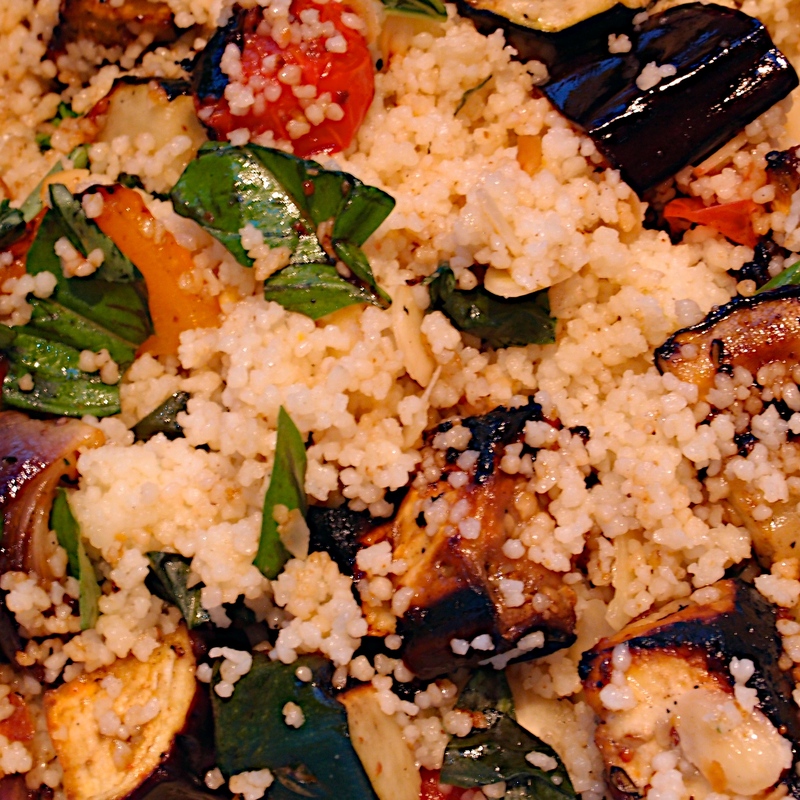 If you have leftovers stir them through some couscous with some toasted nuts and herbs for lunchboxes.